During the mid-1870s, the industrial revolution was bringing changes on the high seas as well as on the land. And when the future looks as though an old sailing line is going to be overtaken by steam-powered ships, a violent clash of interests breaks out in the Onedin family. As The Onedin Line returns this week, Madeleine Kingsley asks Peter Gilmore about his five years as James Onedin. A damp morning in Kew: the most cheerless of February days when nothing flourishes (except perhaps, the botanical greenery under its rococo domes). From the terrace of newish-built houses where Peter Gilmore lives opposite the Gardens there issues a low drone of vacuum cleaners assaulting deep pile; in the otherwise empty road two removal men struggle to disentangle a pair of Parker Knolls. It is, in short, exactly the sort of day that sends every one of us diving for his own particular panacea, be it aspirin, drink - or a touch of escapist romance. 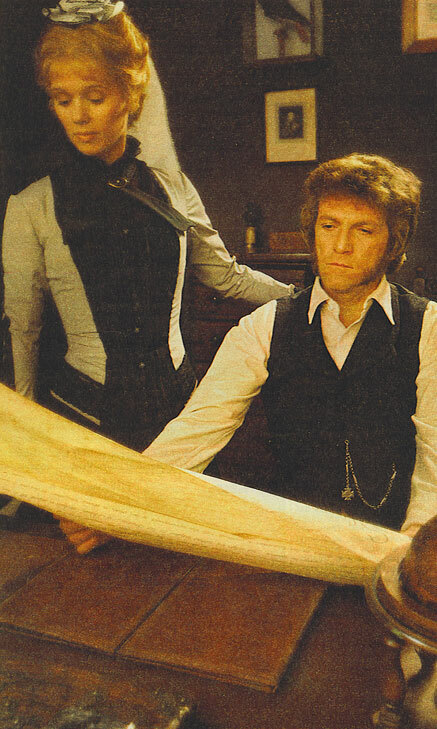 Of such romance, ten million committed viewers would no doubt affirm, Peter Gilmore is a purveyor par excellence; hero of a soap-with-salt opera that has outlived even Upstairs Downstairs (which started the following year). Since The Onedin Line was launched five years ago, Gilmore's craggy countenance has dominated its melodrama of 19th-century Liverpool folk, their sailing ships and the sea. He is the rough-cut adventurer, James Onedin, a man possessed of 'more ambition than Napoleon' - but he's more than a rough trader. Every so often the piercing blue eyes above savage sideburns and tight lips soften enough to reveal a vulnerable Victorian beneath a stony exterior. A seaman whom ladies, like Anne, Leonora and Caroline have each in turn found irresistible and longed to frame in some oval, velvet-bordered miniature. He is something of a working-class Hornblower is James Onedin, managing with a little help from Khachaturyan, to keep all hands on deck and millions of eyes swivelled towards the small screen. It is rumoured that President Tito himself manipulated the transmission time of Onedin episodes to suit his schedule. So far Yugoslavia, along with 28 other countries from Iceland to Israel, Belgium to Barbados have seen the sailing saga on their television screens, and doubtless they are eagerly awaiting the further adventures on the Charlotte Rhodes to be seen here this summer. For Peter Gilmore is, if anything, more of a popular hero abroad than he is in his own country. About half his working life he spends on the Continent, making personal appearances and giving concerts in his gravelly baritone, from a repertoire of heartfelt melodies like 'Home Loving Man' and 'Ne Me Quitte Pas'. British admirers, of course, write too. A thousand fan letters had piled up before the first series of The Onedin Line had come to an end. There are still sackfuls of unanswered letters in Gilmore's upstairs cupboard, where they weigh heavily on his conscience. But, having no secretary he estimates that even at the rate of one every three minutes it would take him five hours to plough his way through a mere hundred replies. To say nothing of all the signed photographs. How could he find time to work as well? One might expect that Gilmore would be savouring the sweet smell of success now, having spent more than 20 years, as he says, 'in and out of character parts, and flop musicals' and having long enjoyed the joke of exiting through the stage door and being asked by the assembled crowd if Peter Gilmore has come out yet. Instead he sits on the edge of his chair in the sitting-room decorated to the pretty Victorian taste of his actress wife Jan Waters, crosses and uncrosses his long legs nervously, rubs at his eyes behind their owlish spectacles and sniffs with considerable suspicion at the small-screen stardom. As if it might vanish with the next trade wind. interests bring them into head-on collision. There followed what Gilmore graphically describes as his 'Lost Empires' period: gloomy auditions and some Good-Companions-style rep in which fading theatre and ex-Gaiety-girl landladies figured largely. Advancement and a £5 a week raise (to £8) came in the early 50s when he was reunited to the ranks of the George Mitchell Singers, the precursors of the Black and White Minstrels. Decked out in spangles or nipped-in soldier suits he found himself memorising 'Sing Something Simple' songs and backing soloists like Eve Boswell at the Blackpool Opera House. They were also the days, or rather the years, when Peter Gilmore could be seen in a wider range of jobs than he can easily recall. He read the prayers on television, flitted through a good many Carry On films and was whistled off the shopping floor by Miriam Karlin in The Dress Factory (1961). He turned up in Hugh and I with Terry Scott and played a medical inspector in The Doctors before they merged into Owen MD. He read Enid Blyton's Island of Adventure on Jackanory (but points out that for a really knock-out thriller he really prefers the John Buchan and H.G. Wells works he read as a child). He has been Prince Charming in a Palladium pantomime and (passing unrecognised because of his short back and no sides) played a cameo part as Private Burgess in the shooting-stand sequence of Oh! What a Lovely War. He is pleased now to be returning to The Onedin Line, which he thinks offers the audience a degree of involvement with characters they have learned to love. And this new series brings a twist to the plot as James Onedin's sister Elizabeth becomes interested in her father-in-law's steamship company and enters into bitter competition with her brother.